Birthdays are the best days! It's no secret I love Birthdays! I always had such wonderful memories of being spoiled on My birthday and I love to pass that on to my kiddos! 1. People are extra nice to you! 2. My sister in law brings me coffee and scones! Yum! 3. My lovely husband spends the better part of a morning chasing me all over school to deliver me flowers --cue the "awww's"!! 5. I get to pick what I want for dinner--Giant Pizza and salads from my favorite place. 6. Kellen actually makes it through the evening without a melt down... Yay! 7. My husband throws impromptu parties and all of our family comes to hang out and eat! Plus I get to see theses cuties! 8. My husband will take real pictures with me, where he is smiling and everything! 9. My mom makes me her famous sheet cake! The next two are totally random and really have nothing to do with my birthday, but this weekend, Callie and I had crafty time at grandma's and she taught Callie and re-taught me how to crochet! She bought us books, hooks and soft beautiful yarn. I haven't had too much time to practice, but I have a few rows of a scarf that I want to make for the winter! Oh the possibilities! My sister in law made this tasty dish! My kiddos LOVED IT! It's the dirt cups from our child hood resurrected on pinterest using vanilla pudding, cool whip, oreos and vanilla wafers and I am sure some other stuff that is full of sugar and calories! Overall it was a glorious birthday weekend, I love spending time with my family and friends and I cannot wait to see what 32 brings!! My, oh my have things gotten crazy 'round the Wood House! This last week has been non stop action. School has truly been great. I love my students and now that we are all done with getting everything set up for procedures, we are finally starting to learn. Hurray! Casual Friday! At my school they have come up with this nonsense about every Thursday we have to wear a college tee, to promote higher education and inform kids about the options and programs at our alma maters. I have 2, count em' 2, ACU tees and I am not going to wear them every Thursday, sorry school! I heart Flamingos! I found this top on super sale at Target this summer and wore when I was in Keystone, it was perfect for a random chilly day last week! 11 KIDS!! I spent an extra 4 and half hours at school to talk about reading and writing with 11 children and their parents. And it was all pretty good kids. We need some better parent involvement. It's a good thing I am on that committee this year. Things have to change! So that's all the fash for this week. More random rants and outfits next week! 1st day of Third Grade! We have been planning outfits to avoid the horrible morning rush. We have been packing lunches the night before. I have been working on power points and planning my agenda for my classes at night when I get home so I don't have to feel frazzled in the morning when the kiddos come. I know that in October we are probable going to be a cluster, but for right now we are smooth! Callie had a wonderful first day of 3rd grade! I am so grateful! Last year was a little turbulent because of some conflicts with her teacher and classmates, but this year, she is so excited for school everyday! Brien and I always go into work late that morning of her first day and get Callie off to school, so we had such a nice easy morning! She wants to be a teacher again...If only she knew! Kellen is NOT having this go back to school situation. He has been "Challenging" in the morning! I LOVE this picture! This girl loves her dad! I love this picture too. The only thing that got Kellen into the car was saying "Let's take Callie to big kid school!" Callie and her bets buddies. I am so glad for her, she finally has friends in her class. I am a little sorry for their teacher, but sometimes a girl needs her besties! It's back!!! Now that school is back in full swing, I am wearing real clothes again. Hurray! It's nice to actually have a reason to get dressed in the morning! Last week we had Professional Development at our school and it is pretty laid back, so I tried to keep it casual knowing that I would be moving furniture and getting messy. We have had students for a few days now and I am excited for the year. Beside being overwhelmed by the sheer volume of preparing I have to do for each class, my kids seem pretty nice and I am pretty jazzed to have most of my kiddos from last year! This was my first day outfit! It was a crazy day! About 2 minutes before we released our students to the buses, the tornado siren started going off. Oy vay! It was pouring rain and some of the ladies that I work with had been outside just a few minutes before and got pictures of some pretty scary funnel clouds right over the top of the school. We ended up holding the students almost 2 HOURS after we normally let our kids go. It was a looonnnnggg day! Day two went much more smoothly and I was able to leave on time. I had to hurry and pick up Callie for "Meet the teacher" night at her school. This was the first year she has ever been in town to be able to go to meet the teacher. She is so excited for 3rd grade and her teachers seems so sweet. It's going to be a great school year! The past few days have been a WHIRLWIND! Wednesday Kellen and I enjoyed our last few days of precious summer. We had our last summer run, tackled some errands and had one final summer library trip and it just so happened to be baby story time! It turns out baby story time is really just playing and singing for 30 minutes, but we had a blast! The look of sheer terror as the soap whips our car clean...Poor baby! Later that evening my darling daughter finally flew back home! It was a 8:30 arrival into town so we had quite the late evening. Her plane pulling in! Kellen was jumping up and down and so excited to see "Catty"! She was the first one off the plane and Kellen ran right for her as soon as her saw her. It all happened so fast I didn't even get a chance to get a picture, darn it! So glad to see this little Callie face! Now all my loves are back under one roof! The next day I had to go back to work, such a bummer! I could have used a few more days with my crazies, but I got school year 11 to start! I think this year is going to be a little crazy, I have 5 classes and 4 different preps to plan. I am little overwhelmed already, but I have such wonderful team mates, I jut know we are going to get each other through! Thursday after school, I took Callie school supply shopping. This year was especially delightful because, we actually had time to get them together. Usually she is in Texas right up until the first day back to school, but this year I was able to partake in the festivities. I just love new school supplies, I mean, who doesn't really?!? We came home to find that our patio was being finished...Hurray!! Brien spent Friday afternoon putting everything back together, it is just beautiful and smooth and perfect! This coming week is going to be super exciting! My students are starting on Tuesday, Callie starts 3rd grade on Thursday! We have all sorts of fun things to look forward to! I love the start of a new year! After our errands on our last wonderful day of summer vacation, Kellen and I came home and made a new treat! They are so good! I am told that they have these at Disney, but I have never had them so I have no idea if they taste the same...Enter the Pineapple Whip! Kids are just so strange! I remember when Kellen was just starting to eat solid foods, he gobbled up everything in sight, now the only thing that he will eat is found in the title of this post... that and chicken nuggets, another popular favorite! We are on week 2 of missing Callie, but she will be back on Wednesday, Praise the Lord! In the meantime we have seriously slooooowed way down! Last week I had a few days to take care of some planning and getting ready to go back to school stuff. I finally was able to upgrade to a new computer at school, 7 short years on the same ol' Dell and it just died! It was nice to have time to work and time to myself, but I am not quite ready to give up my days of nothingness! This made for a fun little game! We made a hole in the top of a old storage container and Kellen was trying to squash the little pom poms in. This made for great fun! We finally got a decent picture together. He is an elusive smiler when the camera is on! Its the old baby gate from the stairs! Re-purposed, it makes for a sweet truck/car/automobile ramp! This kept him busy for about 2 hours! Winning! Kellen takes long naps so I have had time to read not one, but TWO books these past few weeks! The Wedding Girl is super cute. 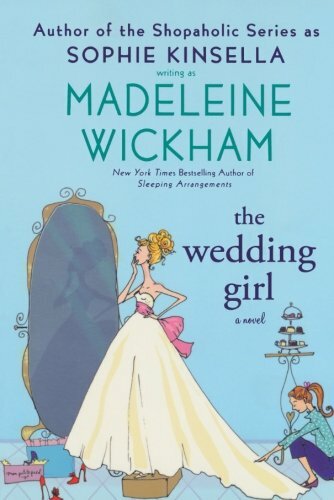 This lady marries a gay guy to help him get citizenship and then when she tries to marry the man she really loves 10 years later, all of her secrets come out...It's a quick, silly, girly book. My favorite! Another great read! 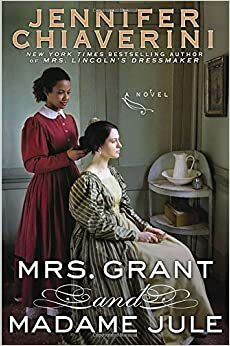 It's about President Grant's wife and her relationship with her slave (even though her husband is THE union GENERAL) It's obviously historical fiction and a little slow in the middle, battle, reunion, have a baby, battle, reunion baby, repeat. But it's a pretty quick read and it's fun to get a little history lesson! So last days of precious summer to go!